Pets & Pumpkins Annual Fall Festival - The Cat Corner, Inc.
​This family fun festival will be for both the 2-legged and 4-legged members of your family and will be held Saturday, October 13, 2018 at Oozlefinch Craft Brewery. This event is not just a fun event full of activities for your family but is a fundraising event to help the animals in the care of The Cat Corner and Animal Aid Society. There will be awesome food, beverages, raffles, silent auctions, family fun activities and live music for everyone’s enjoyment! Even more important than the food and fun, you will be a part of ensuring that our no-kill shelters are able to continue the important work of saving and finding furever homes on the Peninsula. Live music, Food, Craft beer, Vendors and more! ​you will be a part of ensuring that our no-kill shelters are able to continue the important work of saving and finding furever homes on the Peninsula. 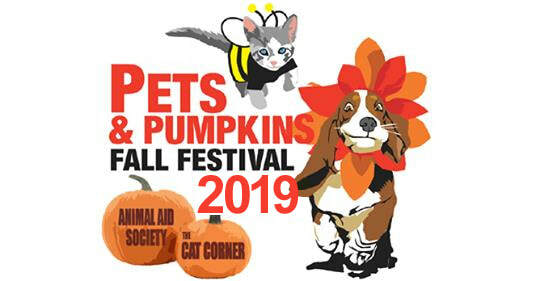 We are accepting Vendors for the Pets & Pumpkins Fall Festival. The online Vendor Form is up and running! Vendor fees are a nonrefundable donation for each organization. The vendor fee guarantees you showing up and goes back to helping homeless and unwanted pets at the end of the day. We are particularly looking for vendors who make homemade treats, animal trainers, agility demonstrations, etc. Please submit your donation payment on this form. If you have any questions or would like to learn more about becoming a Sponsor as well with more advertisement at the event, please contact Tiffany Young at President@thecatcornerinc.com or call her at (757) 642-5496.